I notice that this lists the various DS forms separately. I mention this because I don't see the PSP Go. Ahem. Why is there that 25K limit / filter ? Why not 20K, so Reginleiv count as one ? Personally, I like Reginleiv, so I am thinking real hard to play it by importing it, if there is no announcement by NOA to release it in US by August 2010. Do you have DS, or do you only have Wii ? If you have DS, you can let your Wii gathering dust, and play DS games. Once a Wii game you like show up, you can dust up your Wii, and play it. Me, I still multi-play SSBB and NSMBW and MKW with my family, so I don't really mind the Wii game drought. Heck, I am happy that I don't have to spent too much many to buy games, and having those backlog staring at me, just like it did in the good old PS2 days. Of course, if you are someone who doesn't more work / study 9 to 5, and have lots of free time, you may hate the drought. Since I don't have lots of free time, I don't mind the drought. I'm not complaining for myself- as far as the U.S goes, I think 2010 is going to be a very good year for the Wii. I'm strictly talking about Japanese sales stuff. (and my work day is usually 7-6 so I don't have much free time anyways). Is the Slim bump over for good? Its still tracking positively compared to last year- about 7K more. That said, the "bump" in terms of doing a steady 30-35K a week seems over. PS3 still hasn't outsold the Wii so far this year. Not looking good on Sony's part, and even more shocking on Nintendo's. With no blockbuster releases in the immediate future, it's quite surprising to see the Wii sell over the PS3 week after week. As much as we discus about 3rd party software, what matters is what sells. PS3 is still up 82% YOY and actually went up from the week before without any big new release, so no? EDIT: Err... Forget the "went up" part. I thought I'd seen "27,586". PS3 is doomed. Slim bump is over. Maybe New Super Mario Bros Wii can hold it until Golden Week. I think it actually went down a bit from last week. On a somewhat related note, last year for this week the Wii was ahead of the PS3 by 3K. Yeah, I noticed it and corrected myself. All hardware seem pretty stagnant. Wii reversed it downward trend, the PS3 has been going up and down around the 25k, and give or take some bumps due to game releases, the DS seems to sell about 10k more than the PSP on a weekly basis. It's not really that surprising. It was obvious that New Super Mario Bros. Wii was going to have tremendous legs. I think the Slim bump made people a little hasty in their predictions. NSMB is going to keep it propped up for eternity. It's better than a new release every week. So the bump for Wii this week was due to Reginleiv, right? yeah that's probably the best one since the thread last month where charlequin, who owns a DS, a Wii, a 360, and no functional Sony consoles, was accused of being a rabid sony fan and derailing the thread. The PS3 is in a noticeably superior market position overall compared to last year, but I think the specific bump in interest driven by the Slim and pricedrop is now effectively over, yes. Wiis are on the what now. When is the next Nintendos retailer meeting? As Duckroll explained, the Golden Week deadline is near and Xenoblade is the only game we know that Nintendo could launch. As you said, Q3 and Q4 are strong AGAIN so this might be a strategy. On the other hand, I'm not sure that Wii will enter Q3 at (significant) better position. If nothing else is released, Wii could be selling at 2009 rates by then. I guess next retailer meeting will be close to Europe and America events so that they date whatever they have. This isn't a strategy, Iwata admitted that first half of 2009 was very bad and they would try to correct the situation this year. But something must have gone really wrong with the launching windows of their titles. There is no way Wii does again the pathetic numbers of 2009 H1. Wii HW stops its slide the same week NSMB holds steady, coincidence? and Golden Week this year is way stronger than last's. Second half remains a question as the only confirmed big title so far is Pokemon 5. No Wii releases for the rest of the remaining two months till Golden Week. But its damn impressive for what it has done for H/W sales so far. Voice up what to choose for next week predictions. I can see everything bombing, so choosing is hard. Would like to narrow it to 8 or so. Here's a shorter version of Chris1964 list, taking out budget titles and others that aren't interesting to predict at all. I think BlazBlue Portable should be included, it'll probably outsell Lufia. Actually, would the Everyone's Recommendation line not be quite interesting to predict? It's the first official budget series on a Nintendo system in what seems like yonks, and there are a few relatively high-profile titles in there. I'd say no, but I think you're stating it backwards. The sales for NSMBWii to people already having a Wii must be pretty stable now. There's no reason people already owning the console buy it this week instead of the previous or next one. But I'd say a fixed percentage of people buying a Wii will buy NSMBWii at the same time. So this part of NSMBWii sales is directly tied to the Wii sales. So indeed, if Wii sales are steady, so are NSMBWii ones. Hmm..I'm skeptical that any of them will even chart, honestly. Maybe Muramasa. Hmm..I'm skeptical that any of them will even chart, honestly. I think they're only being sold at certain retailers, too. They are just budget re-releases. Launch 7 at the same time, 6 miss top30, the one that doesn't sells 3000, you predicted 6000, you're already off 100% in the percentage ranking. Really, not a good choice, this week even more since we aren't lacking in number of candidates. Also those budget titles not charting doesn't mean anything; budget titles almost always have a soft launch (IE week one is not bigger than week two, three, four, five, etc). That's the point though; have steady inventory such that a customer who goes in has access to key titles. Out of interest, are Nintendo doing much to promote the *line*? A campaign based around the 'hidden gems of the Wii' concept might be very good for business. I want this setup to do well, it's a great idea for a budget range and I'd like to see it continue. I think this new 'trend' of trackers tracking significantly different is great. Now we can choose to believe whatever numbers please our bias the most! Or is it possible that the secret game is being quietly unveiled in the issue? Did the magazine already cover Pokemon 5 at all yet? How'd I miss that post? Anyway, at least Xenoblade's in it. I think there's a difference in unveiling a game by way of saying "Hi guys! We're pleased to announce that that game that you all knew was coming sooner of later is now coming sooner rather than later!" and unveiling it by actually providing concrete details about it. Total software: 1.007 million (-20.2% from last week). - Prince of Tennis ~75%. what should be noted is that they did a tv commercial. 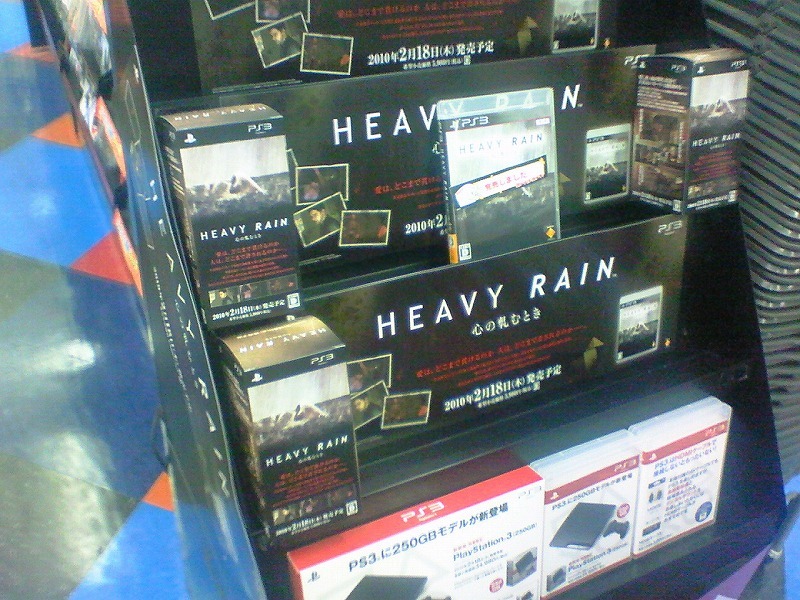 Heavy Rain is apparently sold out in some places. That's interesting. Can't wait for this week's numbers. What is the 'golden week'? Can anyone explain?